Title:"Antarctic Writer on Ice:Diary of an Enduring Adventure"
Now available from Hazel Edwards as a PDF. Antarctica has a mystique. Few have the opportunity to become one of the 'frozen chosen' who work there. Reading about living in remote Antarctica is the next best option. Especially a candid account of the icy challenges and physical beauty of the wildllife. 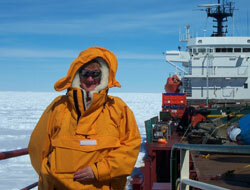 In the role of writer on ice, Hazel Edwards went on an official Australian Antarctic Division expedition to Casey Base in Antarctica, in the summer of 2001. Her candid account is from the unusual viewpoint of an 'older' female who was a non- scientist. Based on e-mails, articles, interviews and observations, it is a unique view, of a working writer beset in the polar ice. When the resupply ship. 'The Polar Bird' becomes beset in the ice, the author is confined with 34 men and 4 other women expeditioners , plus the crew. A sense of humour is a survival skill. And an iceberg typifies writing a book: nine tenths beneath the surface. Hazel returned after weeks in the polar ice, a chopper crash and re-supplying the base, with a profound respect for resourceful expeditioners. 'Antarctic Dognapping' is a short story with photos from the viewpoint of STAY, the donation dog. 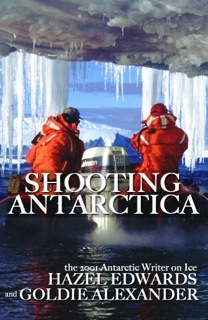 Antarctic Dognapping and Shooting Antarctica are available as e-books directly from Amazon to read on Kindle. Hazel's other Antarctic books include the YA novel Antarctica's Frozen Chosen, a play in Right or Wrong, the picture book 'Antarctic Dad' '. Antarctic Close-Up is junior faction with a time-slip story linked to Mawson's expedition. Latrobe University 'The Looking Glass' article 'Writer on Ice: Writing Styles and Serendipity' . Have you read 'Antarctic Writer on Ice' ? Why not send Hazel a comment? You can email Hazel, tweet Hazel or post a message on her Facebook Page.You could also write your own book review.